When I was in New Jersey visiting my sister, she gave me TWO gigantic boxes of vintage patterns, all uncut! Most are in perfect condition..the few that aren't just have a bit of light damage to the front of the envelope. They're all very fashionable, too, and my size. It couldn't be any more perfect!! Here are a couple that are pretty neat, from the 70s. 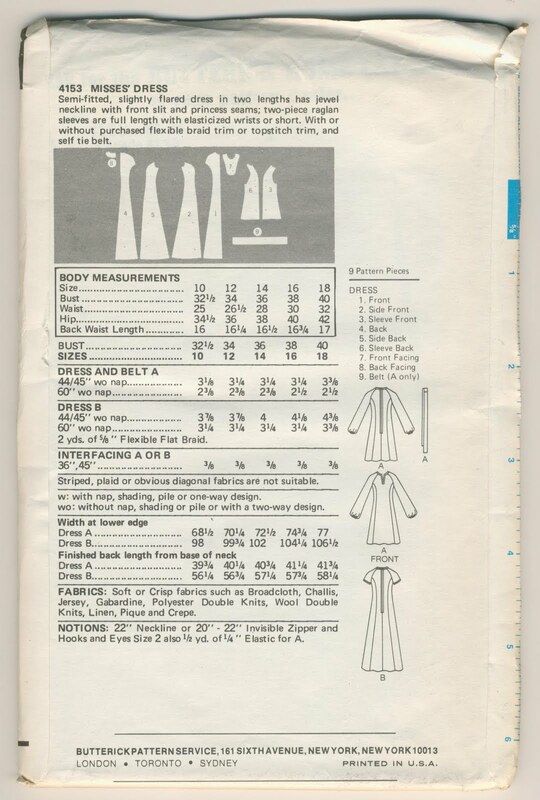 this is Butterick "Seams Slimmer" 4153, in a size 14 (bust 36). 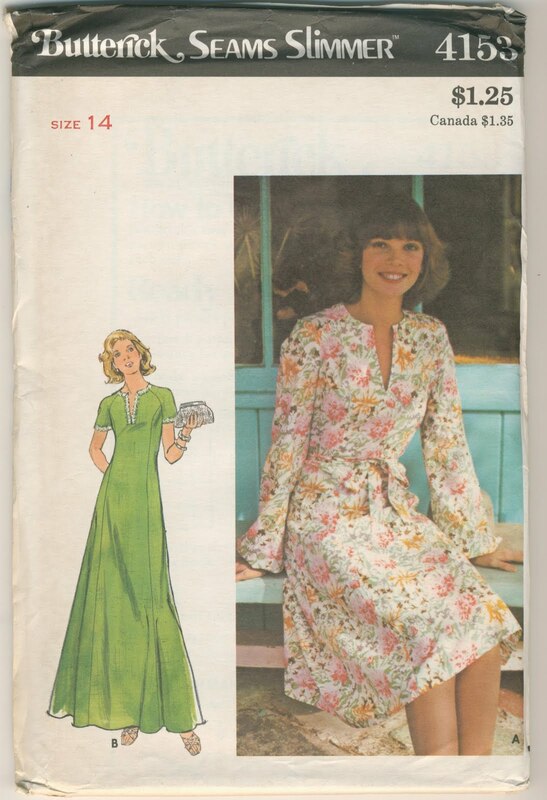 With vintage patterns, I've found the fabric illustrations and examples can be distracting, making the garment seem hopelessly dated. What's important to look at is the design drawing, on the back. 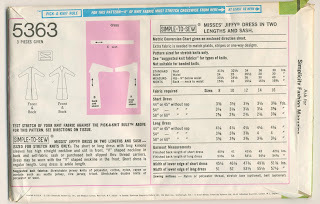 This gives you a better idea of how the item is shaped, and can give you an idea of what the features are, ie, what makes this garment special. 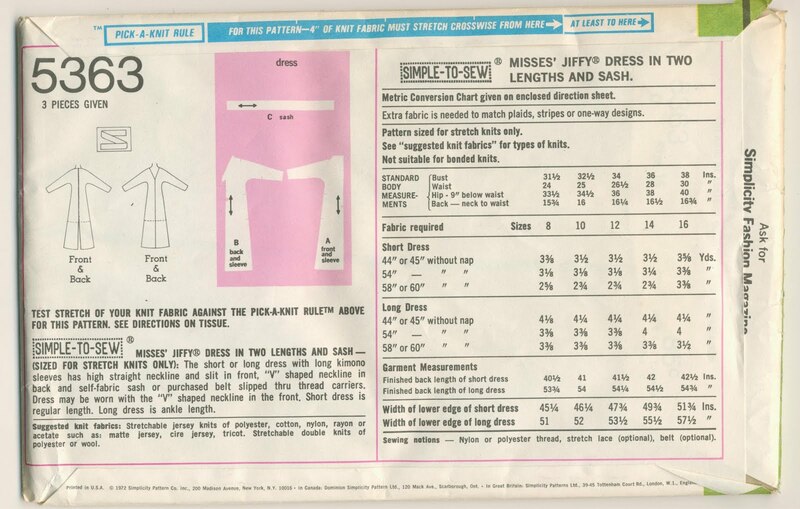 The best thing about this dress is the princess seams, making it fitted to your figure, and the nifty slit neckline. You can see in the drawing that the sleeves are elasticized, but if you look at the pattern pieces, you can see the sleeves are belled, and would look fabulous just hemmed. To make this tunic length, just hem it View A a bit shorter, as the back length from base of neck (as stated on the pattern back) to the hem for size 14 is only 40 3/4. I love this one! It's so simple!!! but I had to giggle that it could be worn with either side as the front....ha ha!! the model in the white full length dress looks like she's wearing some weird wig. this would be SO quick to make with only a front piece and a back piece, plus the sash if you chose to make it. I'm not sure I would chose to have a seam down what's to be the front, and instead might place that piece on the fold of the fabric. 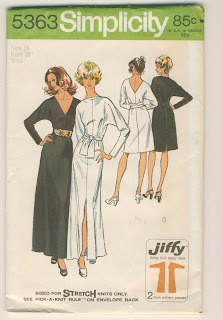 If I were ruching the 6 inches at the neckline/bust vertically, than it may not make a difference. I do think it's distracting, though. The shape of this sleeve is incredible, and I love how chic the v-neck looks!! that Simplicity dress makes me wish I had somewhere nice to go, so I could whip it up!! how handy is it that it's in my size?? I will rarely cut any pattern, at all. If I do, it's one I got for $1 and I'm cutting the largest size. What I do is use Swedish tracing paper, Pattern Ease, and Easy Pattern. I place the tracing paper over the original pattern and trace with a super fine point sharpie. I love sharpies!!! The tracing paper I use is a lot like non-fusible (sew-in) interfacing. In fact, I occasionally buy plain interfacing if I'm at Golden D'or because that's all they carry, and it's cheap. What's especially awesome about it is how durable it is!! There's no ripping or tearing as you pin, the fabric doesn't pull it, and it doesn't get all wrinkled up. AND it's keeps your special patterns intact.